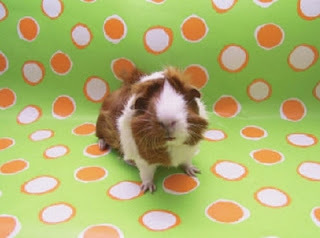 Guinea pigs come in a number of patterns and colors, each with its own unique beauty. Individual colors can be found within each of the following patterns. Agouti pattern—The hair shaft of an agouti-colored guinea pig has several bands of color. Two or more alternating light or dark bands characterize the agouti pattern. The eyes must be a speciﬁc color associated with each individual agouti color. Wild guinea pigs all have the original agouti coloring. Marked pattern—Guinea pigs with the marked pattern are usually white with patterns of another color throughout their bodies. Self pattern—This term is used to describe solid-colored guinea pigs who have a uniform color throughout their entire body. Solid pattern—This is similar to the self pattern, except that it may include agouti and other mixed-color fur as long as this fur does not create a pattern or marking. While each breed has its own breed standard and color varieties, common colors can be found in many different breeds. Here are some of the most common guinea pig colors and color combinations. Beige—These guinea pigs are beige all over their bodies, including their ears and feet. Their eyes are pink. Black—In guinea pigs, black is a deep, rich color that goes all the way to the skin, with matching ears and feet. The eyes are also black. Blue—Blue can be described as a medium shade of gray with a blue or lavender cast. The eyes of a blue guinea pig are dark blue. Brindle—Brindle, a combination also commonly seen in dogs, is an intermingling of red and black hairs. The brindle pattern appears consistently all over the body, and the eyes are dark. white, Dalmatian, and Dutch colorations. Chocolate—The deep, dark brown of a chocolate guinea pig is carried all the way to the skin. The eyes are brown or dark brown with a red cast. Cream—This is a delicate off-white that is even all over. The eyes of a cream guinea pig are red or dark. Dalmatian—Just like the dog of the same name, Dalmatian guinea pigs have a coat with dark spots over a white background. The spots can be beige, black, blue, chocolate, cream, lilac, orange, or red. Dutch—The Dutch-colored guinea pig has dark coloration on the chest, neck, forelegs, and face, in combination with white. The markings are clear and distinct. Golden agouti—These guinea pigs are a chestnut color with an undercoat of blue-black. The coat should also have black ticking. The eyes are dark. Himalayan—A Himalayan guinea pig is white with black markings on the nose, feet, and ears. The eyes are pink. Lilac—This is a medium gray color with a purplish tint that is evenly spread over the guinea pig’s entire body, ears, and feet. The eyes are pink or dark with a ruby cast. Red—Red guinea pigs are a deep, rich red with matching ears and feet. The eyes are dark. orange with ruby red eyes. Roan—This color combination consists of white hairs mixed with one or two other colors. The eyes and ears match the color of the nonwhite hair. Silver agouti—Silver agouti is a bright silver-white, which is caused by a blue-black undercoat tipped with white. These guinea pigs have dark eyes with a reddish cast. Tortoiseshell—Patches of red hair and patches of black hair make up an uneven checkerboard pattern over the bodies of tortoiseshell guinea pigs. They have dark eyes. Tortoiseshell and white—These guinea pigs have patches of red, black, and white hair that alternate from one side of the animal to the other. Their eyes are dark. White—This is a pure white with no brassy or yellow tinge. The eyes are either pink or a dark color.